Context: Finished this off as I flew from Cleveland, Ohio to Dallas, Texas for some training for work. Right from the start, I knew that this was an unusual novel. In terms of both the subject matter and the style of writing, I could tell that Edgeworth had a remarkably unique insight into the world of the Irish in this work. The novel is told in the first person by Thady McQuirk, servant to the generations of the owners of Castle Rackrent a remote house in Ireland. 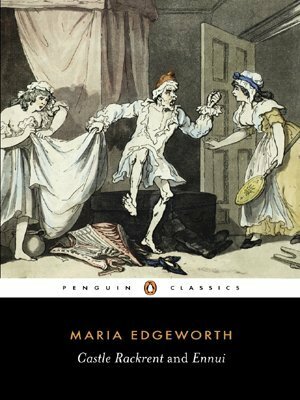 Edgeworth has done well to tell it in the style that he would including a large amount of vocabulary that would have been obscure to the contemporary reader, let alone us reading it now. Thus, she included a glossary to help us! Thady relates the history of the house as each of the owners come and, in various states of debilitation, go. He’s the one unchanging constant in the novel as the house decays around him. I know little about Irish politics at the time it was written, but I wonder how much the novel was related to Irish contemporary history in any way. I couldn’t help thinking that Rackrent had inspired Ishiguro to write Remains of the Day as the point of view was so similar. All in all, I liked it, and there’s no doubt that this was an influential book if not a remarkable book for its time. I think I would have liked it more if I’d understood more of the history of the country at that time and was perhaps more well-read in Irish themed literature. Having, out of friendship for the family, upon whose estate, praised be Heaven! I and mine have lived rent-free time out of mind, voluntarily undertaken to publish the MEMOIRS OF THE RACKRENT FAMILY, I think it my duty to say a few words, in the first place, concerning myself. Did the Warwickshire militia, who were chiefly artisans, teach the Irish to drink beer? or did they learn from the Irish to drink whiskey?